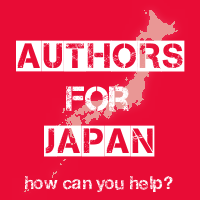 Authors for Japan is a site launched by author Keris Stainton in order to raise money for the Japan Tsunami Appeal. Authors around the world have donated items including signed books, detailed advice for aspiring writers, the chance to name characters in future books, and lots more. The auction closes at 8pm on Sunday 20th March. To bid, simply leave a comment with the amount of your bid in the relevant comment box. See Authors for Japan for full details.